Whose foot is that? I don’t know, but I hear he likes to wear tomato hats. I’m not sure what I expected all this mom stuff to be like. But I know it wasn’t that I would be totally, completely in love with a tiny little person. Sometimes he is sweet and cooey and lovey like in the magazines. Sometimes he is crying, fussy, and red-faced. Sometimes it is bliss. Sometimes it is insanity. But he has stolen my heart in a way I didn’t know was possible. And that is why I think he has the perfectest foot. All together now… Awwwwwwwwwwwwwwwwwwwwwwwwwwwwwwwwwww such a cutie! He looks so different! Still cute, but very different. Babies change so quickly… I’m sure he’s enjoying life on the outside. How can he not, with people making him tomato hats? You’re right. It is a pretty damn cute foot. that is a gosh darn cute foot! being a mom just kinda gets you like that! Squeak! I love the feet and toes. My kids are 3 & 6 and I still love the feet and toes. Great photo. Baby feet… There’s something about 10 little piggies, all plump and tickly, that makes your heart melt. As much as I hate my feet and the feet of my fiance, my daughter’s wee ones still (she’ll be 7 tomorrow) make me smile. You’re not a proud mama, are you? ;o) And that little foot makes me want to rush off and make booties. So sweet! mmmm! I just wanna nibble on those cute lil toes! What a darling boy! Love every moment…my son is 18, and I’m still in awe!!! Big feet and all! Oh my he is so darn cute. I’m in the holding pattern right now at 3cm and can’t wait. Hoping we have a cutie like yours! By the way…I know friends made you the hats, but were could I get one…anyone willing to sell me one? 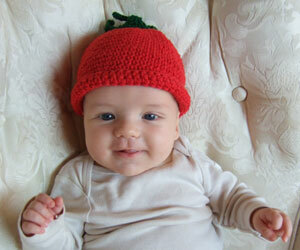 I have gone all high-pitched (in my head… still at work) and adore the tomato-hat picture. A cute foot to go with a really cute hat! awesome photo. those feet are quite cute! OMG! OMG! he is the cutest thing in that tomato hat with that smile! Who wouldn’t fall in love? Regardless of your bias, that is objectively a perfect foot. I don’t know what it is about baby feet, but I want to kiss it. Before you know it those adorable feet will turn into these rather scarey appendages to long hairy legs like my 17 year old son’s! It goes by soooooo fast! Enjoy your beautiful baby boy! What an adorable little guy! 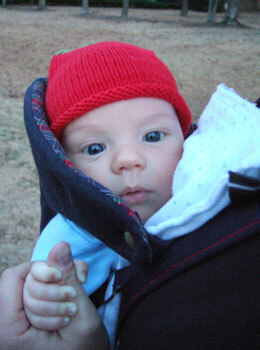 I had a Baby Bjorn carrier and used it for all 3 kids — they loved it and I loved it. Miles is the cutest! I’m new to your blog, but wanted to say that this is one of the sweetest pictures I have ever seen. Babies have the cutest toes! What cute pictures! I love baby feet! Awwwww…those are perfectest little feet. Adorable! 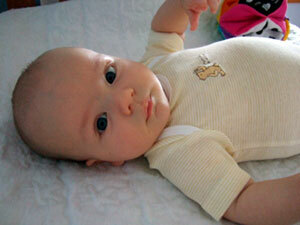 Babies can you get like that …totally unawares…. SOOOooo cute! My son’s name is Miles too, but he’s already 7. Love your blog, just discovered it! That has to be one of the cutest little feet I’ve seen in a very long time. Puddin’ toes are just the cutest – kissable, “fooffable” (that’s when you blow raspberries on their skin in ticklish places like soles of feet and bellies), and playable – this little piggie went to market… and when they find their own toes and start playing with ‘em!!! Just so adorable, and baby Miles’ look just the perfect model, too. Congrats on Miles, and getting back your groove – you’ve been missed, even by those who are really new, like me. Welcome Back! This wonderful feeling will always be there. Congratulations on all the joys of motherhood! He sure does have a cute little foot :) I love the picture of him in the tomato hat! Being a mama just gets better & better. You know you’re a goner (if you didn’t already) when even the baby farts are adorable. My littlest was born a month and a half before your darling boy, and I fall more in love with her every day. Not to mention, they give you a great excuse to crochet more stuff! That is one sharp dressed little guy in his tomato hat–lol. And that tootsie is a real cutie. He sure has grown Donna. My daughter came home today crocheting and taught her self on the web last night. I don’t crochet so that was a big deal.